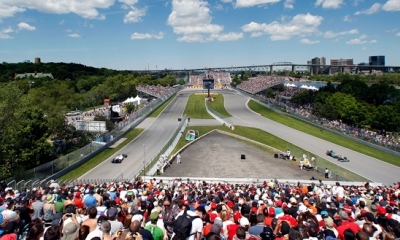 Set on the unique Gilles Villeneuve Circuit of Ile de Notre Dame, the Canadian Grand Prix is one of the season highlights. With a generation of champions in father and son Gilles and Jacques Villeneuve, the Canadian population welcomes Formula 1 every year with the same enthusiasm. 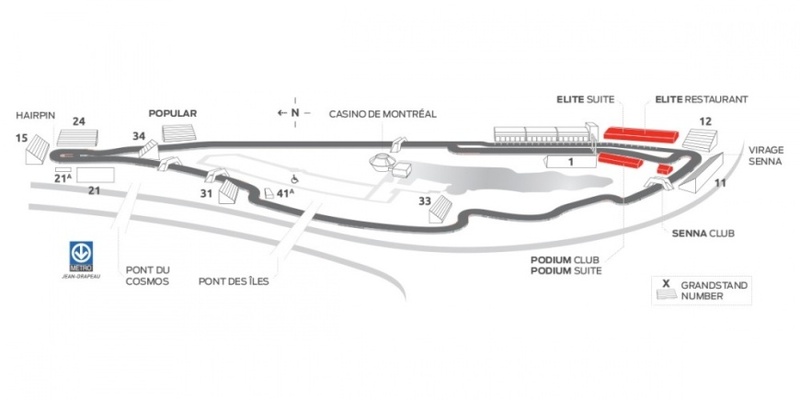 The track is situated on the small Notre Dame Island in Montreal, and showcase surroundings with numerous futuristic-looking buildings. The track itself usually offers spectators a thrilling show due to its high-speed nature and tight margins. This ticket provides access to the General Admission areas, which are spread out around the circuit, notably between grandstands 15, 24 and 22, and around grandstands 33 and 34. Space is limited, so book early to secure a ticket. Seating is mostly on grassy mounds, and views vary greatly, so get to the track early to claim a good spot. Some fans prefer the freedom to move around the circuit offered by a General Admission ticket, as well as the space to spread out. Grandstand 1 directly overlooks the starting line and the grid, and is a great place to watch the adrenaline of the pre-race grid preparations, the dramatic race start, and see the winner take the checkered flag. This is a fantastic spot for speed enthusiasts as well, as you will see the cars blasting past you down the main straight, before braking hard for the first corner. The roar of the engines will fill the air, as well as the cheers of the crowd, famous for its carnival atmosphere. You will also have a great overview of the pit lane, making this an excellent place to follow the evolution of pit strategies, and to watch the skill of the pit crews. Grandstand 11 overlooks the Senna corner, the first gear-tight right-hander at the end of the main straight, and one of the circuit’s key overtaking spots. This is a great place to watch the race unfold, as you will see the braking zone into Turn 1, before looking directly down on the Senna corner, as the cars navigate this tricky technical sector. Depending on your seats, you will see the charge down the main straight, or the exit of the Senna corner, towards the Pont de la Concorde, where the drivers brush the wall on exit. Grandstand 15 is on the outside of the circuit, facing the Epingle Hairpin at the end of the 190 mph straight, a truly spectacular spot where the drivers undergo an incredible 6G-force as they slam on the brakes to take the right-hander at just 35 mph. This is one of the circuit’s key overtaking zones, with vast run-off areas directly in front of you, waiting to claim drivers who miss their braking point. You will have a great view of the entry and the exit, as the cars take a “V” racing line to maximize speed on the huge straight that follows. Hard braking, overtakes, and full-throttle acceleration make this a fantastic spot, made even more exciting by the carnival atmosphere in the 4 large grandstands. The Popular Grandstand (ex grandstand 22) is located on the outside of the exit of the Epingle hairpin, at the end of the 190 mph straight, a truly spectacular spot where the drivers undergo an incredible 6G as they slam on the brakes to take the right-hander at just 35 mph. This is one of the circuit’s key overtaking zones, with vast run off areas waiting to claim drivers who miss their braking point. You will have a view of the entry across the infield, and will be directly overlooking the exit, as the cars take a “V” racing line to maximize speed on the huge straight as they accelerate hard past your viewing spot. Hard braking, overtakes, and full throttle acceleration make this a fantastic spot, made all the more exciting by the carnival atmosphere in the 4 large grandstands. * Conditions: Prices per person in NZ$, twin share on board basis and ticket category as listed above . Payment: 60% non-refundable deposit due at the time of booking. Balance due 100 days before departure. Balance is subject to exchange rate fluctuations and price is guaranteed only upon receiving full payment. Subject to availability and AIM Holidays T&Cs as listed on our website.